And as the next event, in Gibraltar in July moves into view, the traditional spring meeting of the IIGA Executive Committee has taken place on 22/23 March in Guernsey, the host of the NatWest International Island Games in 2021. Amongst the many issues on the Agenda was an update from the Organising Committee of the NatWest International Island Games 2019 in Gibraltar. During a week that starts with the Opening Ceremony on the 6th July well over 2,000 competitors and officials will compete in the “Friendly Games” for the 18th time. Gibraltar has invested heavily in a lasting sporting legacy with many new facilities including a swimming pool, athletic track, indoor venues and much more. A total of 23 islands will compete in 14 different sports and most of the competitors will be accommodated in a Games Village close to many of the different venues. Jörgen Pettersson, IIGA Chairman said: “There is a genuine and inspirational interest in sport in Gibraltar which guarantees the success of the Games. Gibraltar is to be congratulated for the hard and determined work that has been done in order to be the host of the largest multisport event in Europe this year. “That will be the third time that Guernsey takes on the responsibility for hosting our Games. The sporting infrastructure in Guernsey is strong and the people love sports and competition which is a guarantee for success,” continued Jörgen Pettersson. 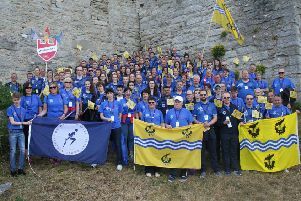 Our Scottish cousins Orkney will host the 2023 games and IIG organisers have revealed discussions have begun with a number of Island Games Associations including Ynys Mon, Isle of Man, Faroe Islands and the Shetland Islands. The IIGA Executive also had an update from the NatWest International Sports Development Programme where member islands can apply for funding for sports projects. So far over £165,000 has been granted to projects within the islands.